One of the nameless, faceless legions of Cobra Command. 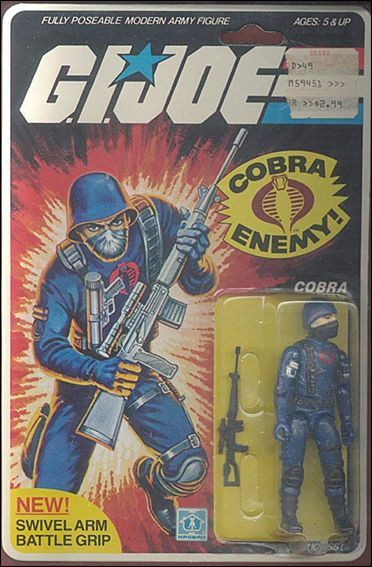 Each Cobra is highly skilled in the use of explosives, all NATO and Warsaw pact small arms, sabotage, and the martial arts. Qualifed Expert: Skorpion (VXOR61) Machine Pistol; Dragonuv (SVD) Sniper's Rifle; Uzi Submachine Gun; M-16. "COBRAS swear absolute loyalty to their fanatical leader...Cobra Commander. Their goal...to conquer the world for their own evil purpose." *Source: Filecard on package. Figure comes with "swivel-arm", accessories and file card on the back of the package.